Čarnogurský and Vishnyakova ULC provided legal services to production company in the process of commercial video production for pharmaceutical company BAYER. 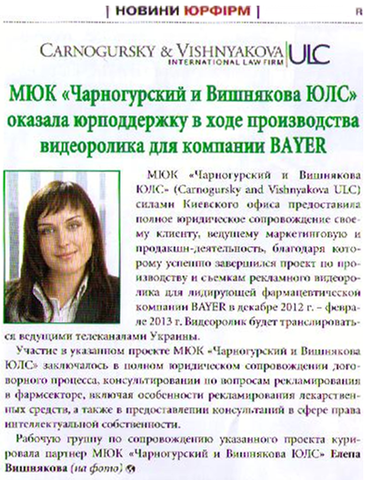 The International law firm "Čarnogurský and Vishnyakova ULC" via its Kyiv office provided full legal services to its client (production comapny) in process of closing deal related to marketing activities of BYER and top television channels in Ukraine. The cooperation was held from December 2012-February 2013. The project assisting by "Čarnogurský and Vishnyakova ULC" consisted in full legal supporting of the contractual process, consultation in the area of pharmaceutical advertisement and advertisement of medicinal products as well as consultation in intellectual property area.